is Saltwood on the Green at Saltwood, near Hythe. Chef Jeff Kipp's CV reveals broader skills that you might expect. Ambition to be the best has, naturally, been a core motivator; starting out as a 'dot-com creative' before changing direction to work his way up in a diversity of internationally-acclaimed restaurants, including Gordon Ramsay's 3-star Hospital Road. Jeff has now made a lifestyle decision to leave behind the extreme pressures of life  seventeen-hour days were the norm  to start his own restaurant. Even so, there is no relaxation of the standards he has set himself for Saltwood. For many of us, the wine is an integral part of enjoying a memorable meal  Saltwood's wine list is diverse and clearly each wine choice has been carefully considered. Most people dismiss rosé wine as the default choice for non-wine drinkers but Saltwood's rosé, from Provence, fully justifies its presence on the wine list; excellent length added to its clean, clear flavours and the appearance in the glass can be compared to the tints of a pink tourmaline. The restaurant room in a high-ceiling old former village general store is most welcoming with a light and airy atmosphere that's evocative of an intimate New England rather than Scandinavian ambiance. This theme is followed through to the food which is fresh, light and contemporary with a menu offering 'Lite Bites' and 'Something Sweet' for those who prefer to have several small accompaniments to a traditional main course. However, for a bargain price of £15 for two lunchtime courses (or £18 for three) you can take your pick: a 'must-try' is the home-made pretzels with rarebit spread  I defy anyone to tell me that they have tasted better! There is no better way to start a meal than with a cocktail and Saltwood's innovative and delicious mixtures really make you feel festive. To start, we ate skate with pickled samphire, citrus mayonnaise, and herb salad; the carrot soup with pickled vegetables followed by pork with fennel and braised beef reflecting a Thai influence. Of course we were tempted to sample the desserts, accompanied by a glass of wine: the cheese cake, confit orange, cardamom and honeycomb was served with a South African straw wine and the rhubarb, pistachio crumble, sabayon and rhubarb sorbet with a glass of Monbazillac. Absolute heaven. Plenty of restaurants talk about local and seasonal produce, but Jeff really does try his hardest to go for the very best ingredients; his technical expertise is evident in his cooking, which relies on real craft that surely deserves a Michelin star in the not too distant future. Together with Gianpaolo's chatty, personable front-of-house style they ensure that not only does all run smoothly but even the children are kept happy. Yes, this is an informal affair where everyone is made welcome. 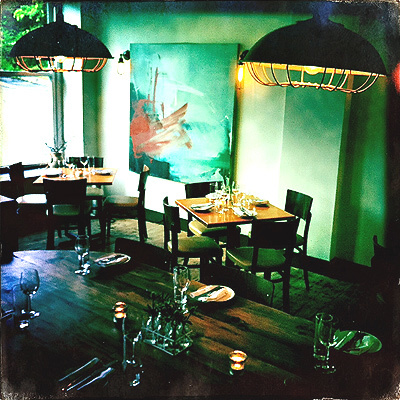 Saltwood on the Green may be small and less than a year old but it packs a punch and must be one of the best kept secrets in Kent  creativity, excellent service and interesting wines, you will find it all here.